Two view of the glass painting. Click to enlarge. Photographs do not do justice to this magnificent piece. This is actually two paintings in one frame. The big ship in the foreground is actually a reverse painting on glass. Behind it is another background painting on a board. We framed this with a protective piece of glass in front and spaced the background painting 3/8″ back from the glass painting to give a 3-D effect. 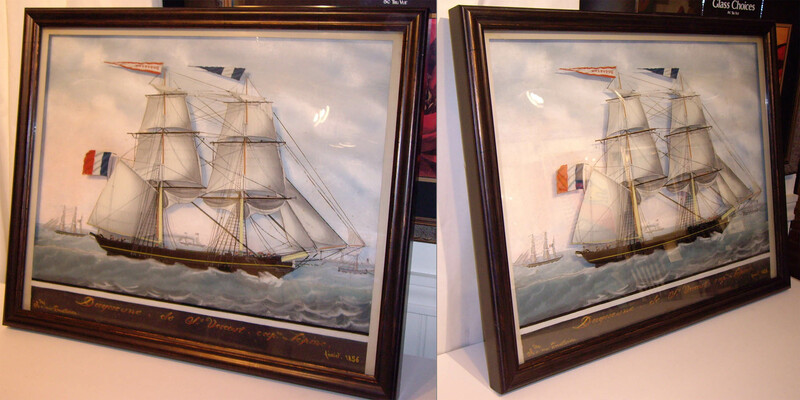 The whole thing is framed in a lovely dark shadowbox moulding that complements the ship nicely! Bring us your treasure and we’ll make it look stunning too!